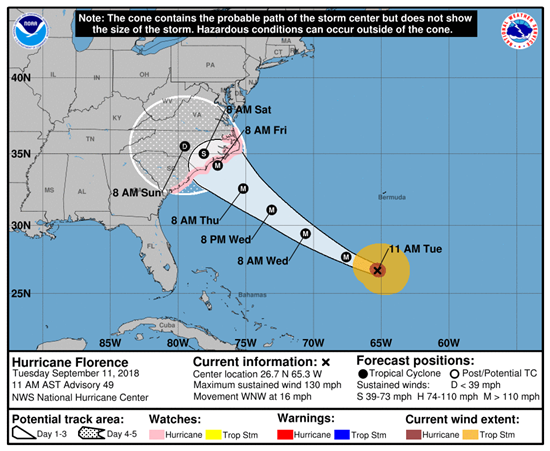 The Town of James Island is closely monitoring the potential of Hurricane Florence and is currently operating at OPCON level 1. The Town participated in an Emergency Management call today with Charleston County and State emergency officials. The Governor held a press conference on yesterday and has issued evacuations for coastal counties effective at noon today with lanes reversals. Please remember there are no voluntary evacuations anymore. All evacuation orders are mandatory. Early evacuations are encouraged now. James Island is in Evacuation ZONE A. [MAP] After the lanes are reversed, everyone on James Island must take SC 171 (Folly Road) to US 17 (Savannah Highway). Evacuees will then travel south on US 17 to I-526 to the reversed lanes of I-26. One benefit to early evacuation (leaving before the evacuation order,) is that you may choose your own route. Sandbag operation will continue throughout today. More information to follow whether they will continue on Wednesday.